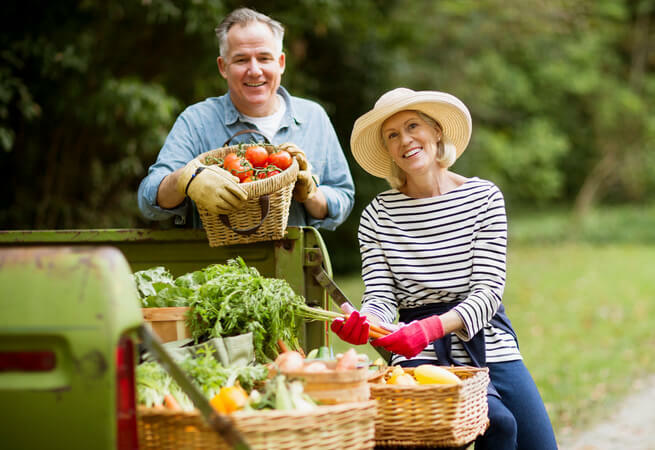 Of all the tactics you can use to achieve a secure retirement, one of the easiest things you can do is to invest your money and earn returns on that investment. Doing this requires virtually no sacrifice, compromise or a lot of work. However, a new study from BlackRock finds that Americans hold 58% of their investible assets in cash where little or no interest is earned. In fact, keeping your savings in cash is like holding onto seeds and never planting a garden. If you plant seeds and tend to them, they will not only produce more seeds but also plants and fruit or flowers. Similarly, if you invest your savings, you get investment returns that can be reinvested to keep growing more and more. Cash — whether it is buried in your mattress or sitting in your checking account — is usually a terrible way to hold money, especially money that you are saving for long term goals like retirement. Imagine that you have $50,000 that you do not need to spend for 25 years. If you put the money in a checking account, you might earn 1% on your money. So, in 2042 you would have:$64,000. However, if you invested your money and earned a conservative 6% rate of return, you would have: $223,000 — more than four times the amount you started with! Even just $1,000 can grow when invested, becoming $1,800 in 10 years at a 6% rate of return. If you want to see for yourself how investing your money or optimizing your investments can impact your retirement, try different scenarios in the NewRetirement retirement planner. Why Don’t People Invest Their Cash? The BlackRock study found that there are many different reasons that people do not move out of cash and into some kind of long term investment. Not Enough Money: Thirty two percent of people say that the amount of cash they have is too small to make an investment worth it. While that may be true when you are just getting started, if you keep adding to your savings and continue to reinvest your profits, your money will grow. Open a brokerage account somewhere like Etrade where you can buy stocks yourself. Try an automated investment platform like Betterment that automatically advises you about different funds to buy. Minimum investments for mutual fund companies like Transamerica or T. Rowe Price can be as little as $500. Bonds can be bought through the US Treasury’s Treasury Direct in denominations as low as $100. Prefer Cash as a Safety Net: Twenty nine percent of respondents say that they want to have cash available for emergencies. Having access to some cash is indeed a good thing. Many experts recommend that you have the equivalent of six month’s living expenses in cash. Don’t Understand Investments: Seventeen percent of people responding to the survey said that they just don’t understand enough about investments and are therefore more comfortable with cash. Another eleven percent say that investing is simply not for them. Take a course or read articles about investing. This can be overwhelming and sometimes a little bit of knowledge can actually be a bad thing. Investing can indeed be incredibly complicated if you are worried about losing your money. Get familiar with your own finances. Most people don’t pay much attention to their personal finances. They worry about money, but don’t take steps to understand exactly why they are worried and what they can do to fix it. The NewRetirement retirement planner makes it easy to look at every aspect of your own financial life as you plan for your future. And, every time you make a change, you will immediately see how it impacts key metrics. Because it is your own information, you can discover things about finance in a meaningful way. Want Quick Access to Money: Twenty seven percent say that they just want quick access to money. If you have a specific purpose in mind, then this may be a good reason to have cash, but without a specific and attainable short term goal, you should probably get the money invested. Concerned About Losing Initial Investment: Seventeen percent say that they are concerned about the risk of losing their money. If you are investing in individual stocks, then your concerns are perfectly legitimate. Individual stocks are considered risky. However, other types of investments offer better rates of returns than banking accounts with less risk. Mutual funds are considered moderate risk. Bonds can be low risk. Not Sure About the Future: An additional eleven percent say that they are uncertain about how the current political environment will affect financial markets. While we do live in interesting times, you may still want to find an investment strategy that alleviates your concerns. Many mutual funds could fit the bill. As you approach retirement and when you retire, you’ll need to shift your investing approach — especially if you need to use your savings for monthly expenses. And, achieving the right balance between cash and investments is very complicated. In retirement, you are no longer merely concerned with growing your assets. You now need to worry about how to turn the money into income, how to keep pace with inflation, how to make the savings last as long as you do and much more. You also need to keep the money earning a significant rate of return in order to retain your buying power. If you are earning a 3% rate of return on your savings and inflation is at 3%, then your “real rate of return” would be 0%. The purchasing power of your money has remained flat. Even though you earned money, you can not buy more now than before. When you withdraw money, you will have less and less assets earning interest. While the math is complicated, a good retirement planner will do thousands of calculations for you to make it relatively easy to see how your savings assets grow and get used. The NewRetirement retirement planning calculator is one of the most comprehensive tools available. Start by entering some basic information and get some initial feedback on where you stand. Then you can add a lot more detail and really get an accurate estimate for how much you need. Best of all, you can try an infinite number of scenarios. See how inflation and different optimistic and pessimistic investment returns impact your finances. Forbes Magazine calls this system “a new approach to retirement planning” and it was named a best retirement calculator by the American Association of Individual Investor’s (AAII) and CanIRetireYet.